Affordable and flexible for use in kindergarten or first grade. 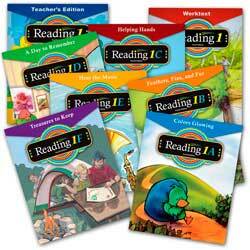 Learn the letters of the alphabet and their sounds in this beginning reading program. Includes worksheets for those who are ready to learn to write—Or hands-on activities for those who aren’t. Take your student on a journey from the creation to the resurrection of Christ as he learns to read. The teacher leads every lesson with all the instructions are right there in the same book your student uses! Read “scripted” lessons and interact with your student. Permission to copy the reproducible pages of the book for your own homeschooling family or in classrooms of ten or fewer students. 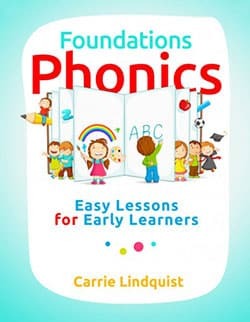 Foundations Phonics: Easy Lessons for Early Readers is new from Master Books. Feel free to go at a faster or slower pace—Gear the schedule to the needs of your child. You will read the lesson, engage and guide your child through the worksheets and/or the suggested hands-on activities. Teacher instructions, a suggested schedule, materials list, helpful hints for using the course are right in the front of the book for you. The lessons are “scripted” for you, the teacher, to read and interact with your student–Great when you are new to teaching phonics-based reading. You are allowed to copy the reproducible pages of the book for your own homeschooling family or in classrooms of ten or fewer students. Gives you the flexibility to choose any, all, or none of the activities—Choose what is best for your child. Foundations Phonics is designed to be completed over the first half of the school year.